The art of highlighting is a very delicate process. It involves bringing forward some parts of the face thereby creating planes and contours. Too much grammar, why don’t I just show you what highlighting alone can do for the face. 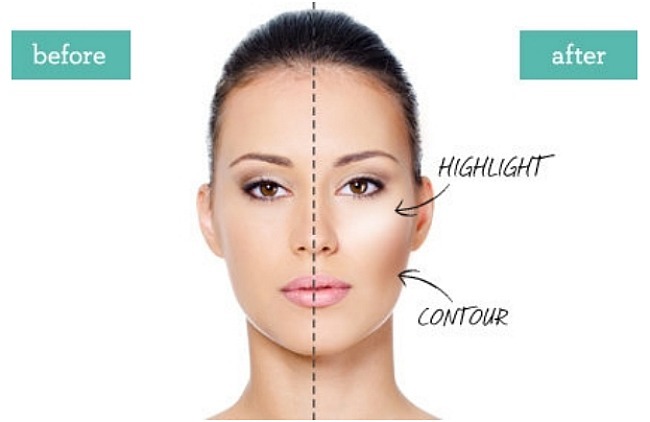 Ways To Highlight – there are different ways you can highlight the face. You can apply it directly to the skin before makeup is done, mixed with moisturizer or even foundation and even after makeup application. Where To Highlight – the easiest way to know where to highlight is to stand outside on a bright day, face the direction of the sun and check where the light hits. You will notice that these are the specific areas middle of the forehead, eyebrow bone, bridge of the nose, upper cheek bones, cupid’s bow of the lips and jaw. What To Highlight With – you can use either crème, liquid or powder products. I personally use powder products because I highlight when I am done but cream or liquid products are usually the best as they are absorbed into the skin and so do not look unnatural. Powder products however need to be blended very well but still, in some cases, sit on the skin and still look a bit unnatural especially when the shimmer granules are large. Be sure to try highlighting your face sometime and see the difference that will make. *Extra tip – a simple trick to open up the eyes is to apply a highlighting product in the inner tear duct area of the eye. A white shimmer product will also do though. LOL, I go crazy when that happens and just use my foundation brush over that area again. Thanks for posting this! I never know how to maximize make up, so this is a big help!